Portugal is not an easy country to get information from, especially because during the 70’s when PETRUS CASTRUS was formed this Iberian country was under a dictatorship that was not very fond on freedom of speech, and this guys didn’t fell under the category of political correct. The fact that their first and better album has never been upgraded to CD and the second one just recently makes even harder the search for their material. Petrus Castrus is an interesting Symphonic band formed 1971 by brothers Jose (Keyboards, bass, vocals) and Pedro Castro (Vocals, guitars, bass), who recruited Julio Pereira (Guitars) and Rui Reiss (Organ) ex members of a band called Play Boys and João Seixas on drums, the name of the band is the latin translation of Pedro Castro. During this first era they were heavily influenced by Pink Floyd, Procol Harum, The Nice and even Pink Floyd, despite the fact that their inspiration is very eclectic, their sound id very close to early British Symphonic, mostly ELP. The band signed a contract with the producer Valentim de Carvalho and recorded two EP’s "Marasmo” e "Tudo isto, Tudo mais” which were well received by the critic, after this releases they signed with a new born label called Sassetti. With this label they released their first LP "Mestre” in 1973, considered one of the best albums of all Portuguese Prog history that I had the luck to listen a couple of times. Due to the controversial lyrics based in poems by Bocage, Alexandre O’Neill, Ary dos Santos, Fernando Pessoa and Sophia de Mello Breyner Anderson that are a statement against the Dictatorship, "Mestre” was banned for three months by the Censorship Commission, it’s even harder to understand why they weren’t completely banned, rumors say they had some strong influences in the Government circles, this album is not available on CD. After this debut album they release a third single called "A Bananeira” still a satirical criticism to the Government, but brothers Castro tired of censorships and temporal banning of their music decide to end the band and leave Portugal to study until 1976. 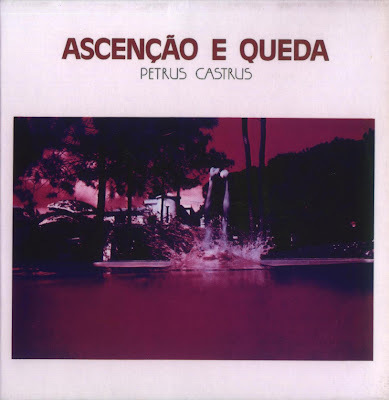 This new incarnation of PETRUS CASTRUS recorded their second album "Ascenção e Queda” (Rise and Fall) released in 1978, a conceptual album much more Symphonic oriented but still very naïve, the concept is about the hopes of the people in a fictional new politician of an obscure nation that after some times becomes a new dictator. The critic was hard with this album, but very appreciated outside Portugal. "Ascenção e Queda” is the only PETRIS CASTRUS album released in CD by a Korean label in 2001. There is not much more to say about this band after "Ascenção e Queda” only was able to find that they released two more singles "Cândida” and "Agente Altamente Secreto”, made a couple of tours and simply vanished from the Portuguese scenario in 1980.
file does not exist in the link. Can u help me? Could you please repost this one? link don't work, or said is unavailable!